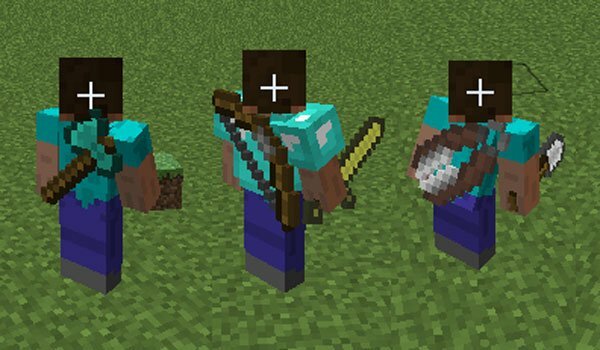 This mod adds a cosmetic change to your Minecraft character and according to the author is based on certain FPS games that allow this option. Back Tools 1.7.2 and 1.7.10 will add back the weapon or tools you used previously. As we say it is only an aesthetic change, it doesn’t add any function, but others will see yourself with this changes. You can see yoursefl change pressing “F5″. How to install Back Tools Mod for Minecraft 1.7.2 and 1.7.10? Paste the “iChun Util” downloaded file inside .minecraft / mods folder. Paste the downloaded mod file inside .minecraft / mods folder. Strut your new weapons and tools!